Fire ants are stinging ants. They are also called ginger ants and tropical fire ants. They evolved in South America, but have become a major pest in North America. They are known for a painful sting. This sting uses a base not an acid. In 1918, fire ants were accidentally moved into the United States of America by a ship from South America. They were moved in large amounts of dirt. The ships brought heavy things like machines from the US to South America. They brought back light things like crops. The dirt was used to make the ships weigh more. The dirt sometimes had fire ants in it. In the United States, fire ants have no natural predators or competitors. Native animals are not adapted to these ants. Fire ants are very aggressive. Their colonies can have many queens unlike many other ant species. Because of this, fire ants have spread very fast. By 1965, fire ant mounds came up on the south eastern coast and as far west as Texas. Today they are found in at least 10 southern states. There is a separate group of fire ants living in California. Fire ants have done a lot of harm as they have spread across the United States. Because they are attracted to electrical currents, they chew through wires. This makes shorts in electrical circuits. Fire ants have also disturbed the natural balance of native ecosystems. In some places, they have killed off 70% of the native ant species and 40% of other native insect species. Each year, about 25,000 people go for medical help because of painful bites from fire ants. 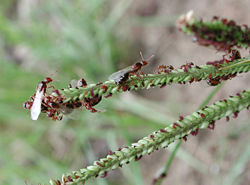 Fire ants attack in groups when disturbed. People often get many bites. Fire ant bites are usually not dangerous. Some people are allergic to fire ants. They may go into shock. This is called anaphylaxis. This can kill them. The fire ants are growing in the US 80 years after they came there. About 157 chemicals, like ammonia, gasoline, parts of manure, and insect-killing pesticides, are used against fire ants. However, none of them were very helpful. By 1995, the government had allowed only one fire-ant bait for people to use a lot. ↑ 2.0 2.1 2.2 2.3 2.4 2.5 Earth Science. United States of America: Holt, Rinehart and Winston. 2001. p. 211. ISBN 0-03-055667-8. ↑ "Imported Fire Ants". University of Minnesota. ↑ 4.0 4.1 "Insect Bites and Stings". MedlinePlus. Retrieved 2010-03-21. Wikimedia Commons has media related to Solenopsis. Wikispecies has information on: Solenopsis. This page was last changed on 27 November 2018, at 08:59.